It's been a while since I picked up a book which hasn't been published within the last few years. A friend lent me this title by Orwell (his first published book) back in November and I've only just managed to dig into it. 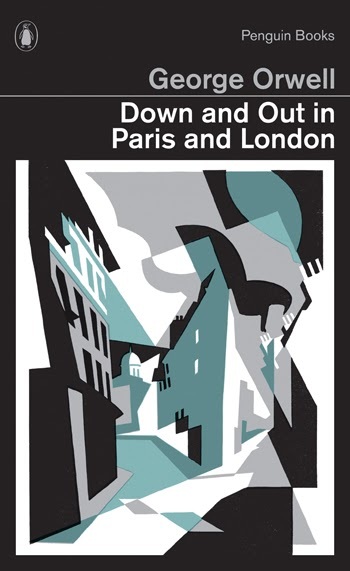 Down and Out in Paris and London is a real life account of Orwell's time living hand to mouth in the lowest streets of the two cities. Starting in Paris, we bear witness to his decline in circumstance having lost his only regular work. He is forced to pawn all his belongings, suffer the first pangs of starvation, and ultimately take on menial work as a pot wash in a Parisian Hotel. He makes the decision to move to London on the promise of work from a friend, which never materialises, instead leaving him going from homeless shelter (or spike) to homeless shelter for a warm drink, a crust of bread, and few winks of sleep. Orwell's writing is vivid and the people he encounters are drawn in such a way as to become real to us. This came as no surprise from the writer who brought us 1984. As readers we experience the squalor and suffering the author was picking up on for the first time. As well as examining the realities of living on the breadline, Orwell takes great pains to provide his own social commentary, particularly in the second half of the book, as he descries the common perception of the tramp as a parasite. His musings on the popular language used to describe tramps are easily transferable to the Tory's modern day rhetoric on benefits claimants, and his desire to expose these popular myths cannot be seen as anything but admirable. He even goes so far as to suggest a solution to the life of the wondering tramps, proposing homeless shelters which offered tramps work and purpose in life (the most important thing to the uneducated tramp), where in exchange for shelter and food, the homeless would work a garden or farm until such places became self-sufficient. The tension comes of course, in knowing that Orwell was an educated man, having attended Eton and having family who were anything but hard up. As such, there is an innate lack of authenticity in his work because while he certainly did experience poverty in Paris and London, this was largely by choice. I also felt that the book read very much like a novel and lacks a certain rawness that those who understand genuine hardship might better understand (Bukowski for example). Indeed, a little research reveals that there is debate over what is fact and what is fiction in the book. Regardless of this minor criticism, the writing provides an insight into the darker sides of poverty, and demonstrates a commitment to social commentary which sustained throughout the author's publishing life. It's definitely worth a read.